When the Miami Dolphins defeated the Philadelphia Eagles on November 14, 1993, one of pro football's most cherished record was erased from the record book. The Dolphins' win gave Don Shula his 325th victory in 31 years as a pro football coach and thus the fabled George Halas' decades-old mark of 324 coaching wins in 40 years with the Chicago Bears went the way of all records that "are made to be broken." 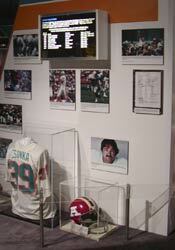 The play sheet from Don Shula's record win (right hand side of exhibit) is on display at the Pro Football Hall of Fame in Canton. 33, he was the youngest head coach in the NFL's modern era. During his seven years with the Colts, a tenure that ended after the 1969 season, Shula compiled a 71-23-4 regular season record. His Colts finished first in their division four times. Shula moved to the Dolphins in 1970 and, while his teams have been consistent contenders - they finished under .500 only two times in 26 seasons - he enjoyed his most spectacular successes ever in his first six seasons in Miami. Tops, of course, was the 17-0-0 perfect season in 1972 but the Dolphins won more than 10 games each season and had an .804 winning percentage (67-16-1) for those years. Shula, whose Dolphins won Super Bowls VII and VIII, is the only coach to have had teams in six Super Bowls. After 33 seasons as a head coach in the NFL, Shula retired following the 1995 season. His regular season mark of 328-156-6 combined with a 19-17 post-season record gives the legendary coach a career mark of 347 wins, 173 losses and 6 ties. Just as Halas' mark stood the test of time, Shula's career coaching wins should very well hold for decades.